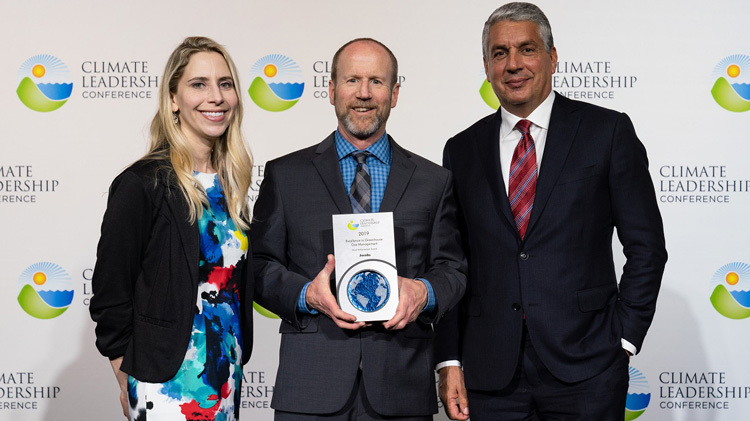 Dallas — The Center for Climate and Energy Solutions and The Climate Registry, in partnership with headline sponsor Bloomberg Philanthropies, recognized Jacobs with a Climate Leadership Award for Excellence in Greenhouse Gas Management (Goal Achievement Award) at the eighth annual Climate Leadership Awards on March 21, 2019, in Baltimore. Awardees were honored for exemplary corporate, organizational, and individual leadership in reducing carbon pollution and addressing climate change in their operations and strategies. The Excellence in Greenhouse Gas Management (Goal Achievement Award) recognizes organizations that publicly report verified organization-wide greenhouse gas (GHG) inventories and achieve aggressive GHG emissions reduction goals. CH2M, now Jacobs, set a goal of 25 percent reduction in absolute GHG emissions by 2017 for global operations as compared to a 2012 baseline. The company exceeded its five-year commitment to reduce operational GHGs, ultimately achieving a 29 percent reduction since 2012. The company achieved this reduction by implementing a facilities management plan that included reducing energy consumption and GHG emissions for vehicles and buildings at its most energy-intensive project site; improving the efficiency of four LEED-certified headquarters buildings, which are also Energy Star certified; implementing office behavior-based energy conservation programs; and managing the company’s office space footprint. The company also achieved reductions though purchased renewable energy, consistent with separate commitments to USEPA’s Green Power Partnership, as well as modest investments in carbon offsets. Through Jacobs’ PlanBeyond strategy for sustainability, the company is driving solutions that achieve positive environmental, societal and economic outcomes for businesses, governments and communities around the world — from internal business operations, to the work performed with clients and other organizations. Jacobs advances innovations that improve energy efficiency, resilience, conservation, reuse and reclamation of vital air, land and water resources. “Our recently launched sustainability strategy, PlanBeyond, provides us with a roadmap for not only integrating the triple bottom line into our operations and across our culture, but how we work with clients, suppliers and other partners to drive progress towards the United Nations Sustainable Development Goals and seize opportunities to make a positive difference for society,” said Jacobs Global Sustainability Director Zoe Haseman. The Climate Leadership Awards take place during the Climate Leadership Conference, which brings together forward-thinking leaders from business, government, academia and the non-profit community to address climate change through policy, innovation and business solutions. More information about the Climate Leadership Award winners is available at https://www.climateleadershipconference.org/clc_awards.